Honey in your coffee, tea, or any drinks, toast and biscuit sounds great. For its healing properties, it is also excellent on cuts, burns and wounds, and even works wonders as a moisturising cleanser on the skin and hair. 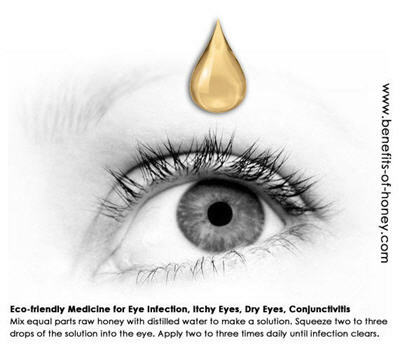 But when suggested as an eye drop, you immediateoy get the wide-eye stares... Full account in: Honey for Eye Infection. On the topic of keeping bees as a hobby in Singapore, my first findings from the authorities ended in March 2012 with the conclusion that beekeeping is allowed so long as no complaints about the bees are being lodged to National Environment Agency (NEA). However, subsequently in Feb 2013, much to my surprise, one of my page visitors wrote to me and said the Agri-Food & Veterinary Authority of Singapore (AVA) told him that bee-keeping in Singapore is only allowed for exhibition purposes... Full account in: Start Beekeeping in Singapore.